The day when a holy person is born on earth, I wonder if God doesn’t allow himself a little fantasy, something to signal the event or to celebrate the one he has predestined from all eternity to make his glory shine ? After all, isn’t a birth an explosion of joy, in heaven as well as on earth ? Would you like to follow me in my dream ? I visualize anew that special day in the heart of God, the birth day of the Foundress of the Missionary Sisters of the Immaculate Conception, the Venerable Délia Tétreault. I see the Lord discussing with his Mother on the most appropriate place for her to be born. First of all, it was essential and fitting that the one who was later to become an ardent apostle of the Mother of the Lord be born in a town dedicated to the Mother of God. The Lord and his Mother agreed on what that place would be. Besides, must have remarked the Blessed Virgin, Marieville is located a short distance from Montreal, the city once named Ville-Marie in her honour. That whole day of February 4, 1865, snow fell on Marieville in soft, quiet flakes. Light and fluffy, it wrapped the entire countryside in an immaculate coat that glittered like a million twinkling stars in the last rays of the dying sun. It was in this atmosphere reminiscent of a bed of lilies that Célina Ponton, the wife of Alexis Tétreault, gave birth that evening to her twins, a robust little boy, Roch, apparently as sturdy as his name, and a frail little girl who seemed rather on her way to a premature death. The Lord’s plans are necessarily realized by means of human beings and in the eyes of the latter, they sometimes appear disconcerting. Thus, the mother deemed it proper to intervene and manifested her intention to have uncle Alix stand for the little girl as her godfather, for she felt that she would need it more. Everyone bowed to the wishes of the dying woman, not wanting to contradict her. Little Délia was indeed very frail. The fearful mother held her baby girl to her heart, but to her great surprise, it was her twin, little Roch who, though sturdy, was mysteriously swept away by death only seven months after his birth. The poor mother’s health seemed in serious jeopardy. Sensing that the end was near, she called Délia’s godfather and her sister Julie and begged them to adopt the little one. Turning in anguish to her sister Julie seated by her side, she added prophetically : "Don’t worry, I shall help you to take care of her. Make a saint out of her !" And the poor mother quietly breathed her last, leaving her bereft husband Alexis with seven young orphans. Little Délia was only two and half years old. As the bitter autumn wind sweeps the birds away from their nest, the Tétreault home was soon emptied of its young. Mr. Tétreault saw his home shattered forever. He understood that, without the support of his wife, he would be unable, on his farm, to provide for the needs of his loved ones. Therefore a major decision had to be made. He did what so many French Canadians of those days did who saw no other way out but to migrate to the United States. He too left, bringing along a few of his children and entrusting the others to close relatives. Délia went to her new home of adoption, with her uncle Alix and her aunt Julie. All children like to rummage about and to hide in the most amazing places. It is their escape from the orderly and regulated world of adults.. Délia also had her hiding places. Her greatest delight was to hide in the attic of her home. She spent hours and hours reading old annals of the Holy Childhood and of the Propagation of the Faith stored away in boxes. Sometimes, she got really excited about the actions of the missionaries and was filled with admiration for the men and women religious who had this privilege of sowing the seed of the Good News in those foreign lands. Nourished by those images of missions and missionaries, little Délia had a dream one night which was definitely a premonition. Listen to her : “I was kneeling near my bed, and all of a sudden I saw a field of ripe wheat stretching as far as the eye could see. At a given moment, all those ears of wheat were changed into heads of children. At the same time, I understood that they represented the souls of pagan children.” Did the sight of a fertile field yielding its fruit at harvest time give her a preview of the happy times when her sisters would reap in joy after having had to sow in tears? Aunt Julie spared no effort to give her daughter a solid Christian and human upbringing. Thus, in order to preserve the family spirit, she would invite Délia’s brothers and her sister Victoire during the holidays. When the time came for Délia to go to school, her aunt entrusted her to the Sisters of the Presentation who had a convent in Marieville. This is how Délia spent the years of her early childhood. She grew up in an atmosphere of peace, serenity, love and harmony. Struck by the images of this dream, Délia discovered therein a missionary calling. She realized that she not only had deep admiration for the missionary life, but also a strong attraction to the religions life. This was not without some resistance, for she found it difficult to leave everything to become a religions. At 18, she cut her hesitations short and requested her entrance to the Carmel of Montreal. She was refused, undoubtedly because of her frail health. She then turned to the Sisters of Charity of Saint-Hyacinthe, where she was accepted. There, the Lord made her understand that she was to found a Community dedicated to the missions. The inspiration was quite clear in a small room performing a quite ordinary activity. "It seemed to me that Our Lord was telling me I was rater to found a Congregation of women for the foreign missions and work at the foundation of a Seminary similar to the one in Paris..." A severe epidemic of fever having declared itself to the noviciate, Délia was forced to return home to Marieville. The same year, she experienced the Holy Spirit permeating her whole being with the assurance that He would be her guide. Délia thus had her calling confirmed, but she did not know how this would come about. For nearly 20 more years, she searched patiently to find her way and to achieve her mission. Involved in a ministry for the poor in a low-income district of Montreal, she was continually obsessed by the idea of the foreign missions and wondered: "Shouldn't Canada, which has received the faith through missionaries who came from France, bring in turn this invaluable gift to other countries? Do we not need to organize in this country a formation centre for missionary vocations?" She felt called to work at this, in thanksgiving, in the manner of Mary! 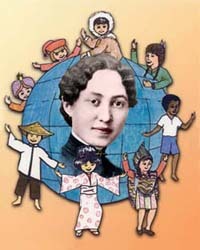 At the beginning of the twentieth century, her missionary plans rapidly came into focus: 1902, opening of a school of formation for young women destined for the foreign missions, and by the same token, founding of the religions family she had wished for; 1904, approbation and blessing of her Institute by Pope Pius X; 1909, first departure of six of her Sisters for China, 1912, 1913... further departures. In ten years, 26 sisters had left for Asia. For many years, it was like an explosion of various foundations, first related to the missions of China, then to those of Japan and the Philippines. From 1902 to 1933, a period marked by the First World War and by economic crisis, our foundress opened 36 houses, 19 of which were in Asia, 16 in Canada and one in Rome. After her death on October 1941, other countries received her missionaries: Haiti, Cuba, Malawi, Zambia, Madagascar, Taiwan, and later Bolivia, Peru and Chile. In spite of her great desire to go and see the work of her missionaries, Délia was never able to set out for foreign missions. Her health would not allow it, but she wrote to her missionaries and thus remained in close communication with them wherever they went. She has left more than 2,000 letters, most of which were addressed to her Sisters. This correspondance extends over a period of nearly 40 years. Echoing the daily life of the missionaries as well as the most diverse and unexpected situations that occurred, this correspondance is invaluable as it captures the history of our religions family and the personal history of our Foundress. It enables us to see how our Community, through its works in Canada and in mission countries, integrated itself in the Church of the times, and more especially in the missionary world. One also becomes aware of the many problems that had to be faced in those days. Délia Tétreault left us in these pages all that she was, including an unforgettable spirituel legacy, a spirituality of thanksgiving lived with Mary and bearing fruit through missionary action. On Monday, October 6, a funeral service was held in the chapel of the Mother House of the Missionaries of the Immaculate Conception, 2900, Saint Catherine Road, for the Very Reverand Mother Marie-du-Saint-Esprit, Foundress of this community, the first missionary congregation of Canadian origin. The deceased, née Tétreault (Délia), was from Marieville, in the county of Rouville. She was 76 years of age and had been 39 years in religious life. On Wednesday, October 1st, the Very Reverend Mother Marie-du-Saint-Esprit (Délia Tétreault of Marieville, P.Q. ), Foundress of the Institute of the Missionary Sisters of the Immaculate Conception, died at the age of 76. 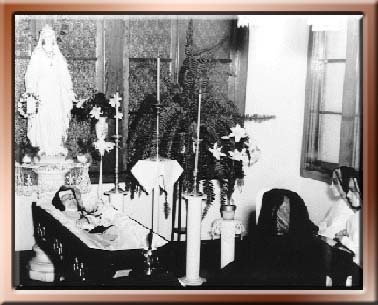 She lay in state four days at the Mother House, 2900 Saint Catherine Road; approximately one thousand people came to pray over her remains. The funeral service was celebrated in the same house on Monday, October 6, by His Excellency, Archbishop J. Charbonneau of Montreal. The mortal remains were then taken to the Novitiate of the Institute in Pont Viau, where they lay in state until the next morning, as the novices could not have the privilege of going to the Mother House. A second service was held at 9 o'clock on October7. The venerable deceased was buried in the cemetery of the community located a few hundred steps from the walls of the Novitiate. A saint has just died, leaving an immense work. In this humble, but valiant woman, Canada is losing a great apostol of distant lands and of all holy causes; but it retains from her most fruitful life an imperishable memory, the example of heroic vertues and works that have already been abundantly blessed by God. Thanks to the zeal of Mother Marie-du-Saint-Esprit, and especially to the clarity of her vision, The Institute began on June 3rd, 1902, at Notre-Dame-des-Neiges, Montreal, under the benevolent patronage of His Excellency, Archbishop Paul Bruchési an under the direction of Father Gustave Bourrassa. On May 1st, 1903, the nascent community moved to 27, Saint Catherine Road, Outremont. There would be no end if we were to enumerate all the works that came into being because of the apostolic idea which germinated int he mind of the venerable Foundress whose death is mourned today by the Missionary Sisters of the Immaculate Conception. In the words of her companions in religious life, she was a humble and a holy woman. We believe this, for a tree is known by its fruit.